Entirely built in Portugal, in Navalria, of Martifer Group, in Aveiro and full equipped with national furniture from Paços de Ferreira, the hotel-ship AmaVida presents itself with a luxury design where the comfort and the elegance are shown up in every detail in order to give our passengers a nice and unforgettable journey during their cruise in Douro River. With the capacity for 108 passengers distributed by 54 double cabins, every one of them equipped with panoramic windows that give landscape vision of 180 degrees; All cabins are equipped with HD TV, with access to several international major channels, and a Video On-Demand system. This ship has an Al Fresco restaurant that allows all passengers to enjoy the landscape while indulging themselves with the finest Douro cuisine and with the worldwide famous wines of the Douro Valley, as well. Passengers can enjoy a nice heated pool located on the sundeck, as well as keeping in shape on the ship's gym or relax during a massage therapy on the onboard spa. This ship is equipped with a state of the art optical fiber network that allows very fast broadband Internet access via Wi-Fi (hotspots located throughout the ship). DouroAzul strives to improve its guests experience and to innovate regarding the activities it offers during its cruise. MS AmaVida has a helipoint on the sundeck, allowing the operation of a small helicopter that will offer passengers the opportunity to add aerial tours of the Douro Valley to their cruise experience. 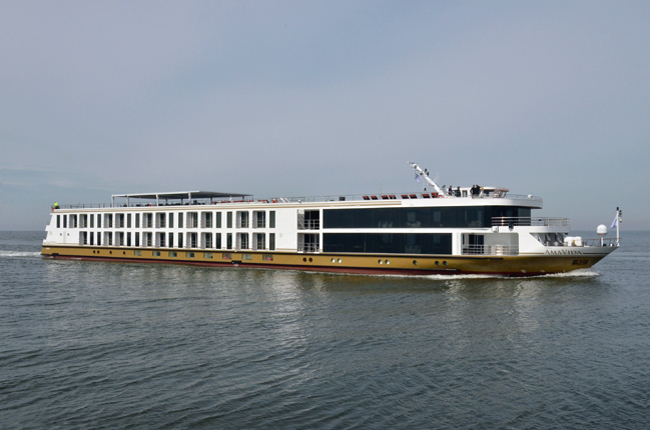 With the MS AmaVida DouroAzul went further on its mission for a more “green cruises” on the Douro River, and created a 156 square meters area equipped with photovoltaic solar panels on the sun deck that will generate energy to be used by the ships systems. The MS AmaVida is included in the "DOURO PRESTIGE" project and Involves a global investment of 13.173.808,67 euros, of which 13.058.808,68 euros are ellegible for a communitary comparticipation through the SI Inovação program of 8.488.225,64 euros.